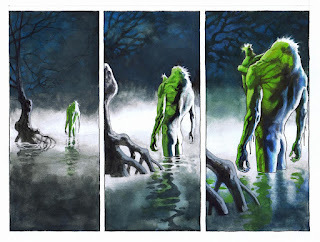 Kevin Nowlan: Finally, The Man-Thing Graphic Novel! 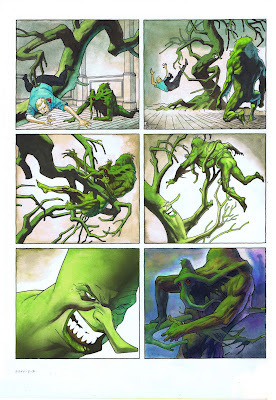 Not quite the Man-Thing I remember, but I look forward to seeing the entire graphic novel. Thanks! The genius of the late, great Mike Parobeck. I thought that might have been his work. I miss him. Any chance we'll finally see the Clayface story now? That Clayface story was finally published in this anthology. Not quite but close enough to make me do the math. absolutely stunning...oh i am giddy with anticipation. Looks great. Excellent news! I have been waiting for this book to come out ever since you first posted a few panels back at the Yahoo group. Thanks, Gerry. And that was some nice coloring you sent me today! I just looked at the amazon.com listing and it is described as a 114 page hardcover. I thought the ManThing story was a 48 page stand alone story...has it been expanded over the years or it some of the material classic reprints? The new story is 62 pages and yes, it's a stand alone story. Looks like they're including a reprint of Man-Thing 12 in there as well. some of my favorite work I've seen from you...been fortunate enough to see some of the other pages before...and I've been waiting for this book for easily 10 years! Will the hardcover be "oversized" or standard sized? I don't know many details yet. Looks like it'll be published as a three issue miniseries first and the collection will be published in October. Kevin, my appetite was whet for this so long ago that I've run dry from the years of drooling. Is this the same one that was listed, I believe, in the 1990 Marvel Age Preview? Because I am going back in time and telling myself that I WILL see it one day and he/me will be thrilled. Very excited to finally see this. It's been like an Urban Legend through the industry for many years. BTW: Loved the sketch book you did for Heroes last year. I had a friend pick it up since it never seemed to work out meeting you whenever I would come over. Quite exceptional! Looking forward to it. I just noticed in the solicitations they were breaking this up into issues? It won't be a single GN? Yes, it will be. The HC goes on sale in October but it looks like it'll appear as a 3-issue mini-series before that. It's weird, but as long as it's published I don't really care what format(s) they use. Great news! Anyway I got ahold of the latest Batman Odyssey issue by Neal Adams and was surprised to see your inks. Would you mind posting some of the pencils and your inks? I'm very curious to compair them. Are you also involved in inking the last issue of this series? No, I think the last issue is all inked by Neal. I'll try to post some of the pencils later. Hey, Kevin - I am Steve B's nephew, and met you at your home in Salina years ago. I saw the pages to this story at your place and I have been hoping to see this story in print since then. Wow! A must get! I recall seeing pages at Marvel ages and ages ago! I think Terry K had them. Or maybe Harras...? Still, after so long I never thought I'd see it printed! So happy! If I buy one graphic novel this year, it'll be this one! Wow, I'm a giant-sized fan of Man-Thing, to this is terrific news! Also a Gerber fan, so just wow! May I say, as someone with a modest (but growing) collection of Man-Thing comics, that your take on Man-Thing is very pleasing. Although I equally appreciate the uber-realism often used for depicting Man-Thing (you know, details down to the edges of leaves and crevices in tree bark), I've long thought that the character's supernatural aspects are well suited to more abstract, stylistic renditions. All that's to say, kudos! This Man-Thing fan is stoked. It’s the story no one thought existed —Steve Gerber’s final Man-Thing tale! First, in the classic “Song-Cry of the Living Dead Man,” Man-Thing stumbles across a lone man, desperately scribbling down his thoughts in the halls of an abandoned insane asylum. But this man’s inner demons appear in the flesh to torment him — and it’s driving the Man-Thing mad! Will Brian Lazarus succumb to the madness of everyday life? Then, in Gerber’s never-before-seen sequel, what is the mystery behind the “Screenplay of the Living Dead Man”? Collecting MAN-THING (1974) #12, INFERNAL MAN-THING #1-3 and material from SAVAGE TALES (1971) #1. Que belleza su trabajo Kevin, estas páginas a color son realmente asombrosas!. saludos desde alguien que admira su trabajo desde hace años. That beauty work Kevin, these color pages are truly amazing. Greetings from someone who admires his work for years. This looks great. Looking forward to getting it. So, is it fair to say the novelty has worn off? I miss your posts here. But I blog 2-3 times a month, so I ain't complaining, just despairing! Good to see this finally coming out, Kevin. I remember when you were painting it. Picked up the second issue. Looks good. As inspiring as they are, I've been hoping to read the whole story some day... what a treat for fans of Steve and yourself! What is the title of the book? I can't find it on Amazon.